Though the snow is still thick on the ground (and filthy. And ugly. I hate snow this time of year) spring has, in fact, sprung, which means it's time to start preparing for the Maine Pottery Tour. 39 studios this year! This little slideshow gives you a preview of work you might see. 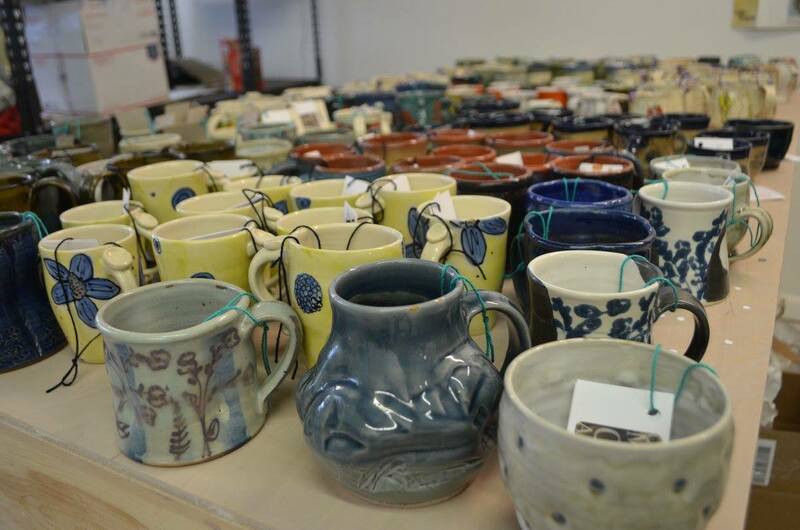 Here's how it works: Stop in one of the shops, buy a handmade mugs (for the low, low price of $18! ), get a free cup of coffee. I love the win-win-win aspect of this event: customers get free coffee and a bargain, the shops get customers seeking them out for the Mug Season event, school districts get a little cash, and us? Well, the potters get a check during a time of year when checks are a little thin on the ground. Mug Season is brought to you by the Central Maine Clay Artists, and the word WOW. If you've ever thought of making press molds to make tiles and other flat items easily reproducible, Shawna Barnes has got those mad plaster skills.Check out this tutorial, and the rest of her blog. As a bonus, Shawna is smart and fun and funny. If you aren't reading her, you should be! Though most of the pots out of my last firing had places to be before I could even get photos of them, I did score a bunch of minis that made me very happy. These tiny pots are what I make when I've been throwing off the hump, and the last bit of the hump isn't big enough to make one of whatever-I've-been-making. They help me use kiln space efficiently, because I can tuck them into corners that would otherwise be wasted. I sell them for $15 each. I am thinking of displaying them in a bowl, like this, next time I do a show. They look so appealing all together like that, like Easter eggs, or candy. Sometimes it's literally the little things that make me happy. Making soap is like making pots in a couple of ways. One, it feels like a marriage of science and art. And two, it involves a fair amount of patience. 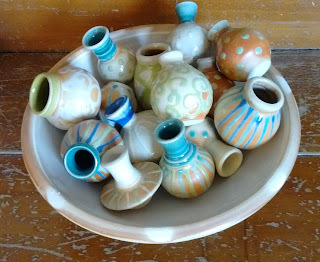 With clay, the wait involves drying and firing. With soap the wait is all about the lye and fats doing their chemical dance, sapoinfying their little hearts out. Once the deed is done, there's no more lye; it's all been consumed in the process. That's why the wait is so crucial. But now, dearhearts, the waiting is over! The soaps that I made is February are finally cured and ready for sale. Choose your favorite, and get 'em while they last. Though the bitter cold is insisting that winter has much fight left in it, nevertheless it is time to be preparing for spring projects. In addition to orders, I'm getting the ball rolling on two big events: Mug Season, and the Maine Pottery Tour. I took advice I got from several people and switched to Google Maps, which I'm told are more user friendly, and also have the advantage of being free; but I am still figuring out aspects of them, like how to number the markers, or how to include a list. 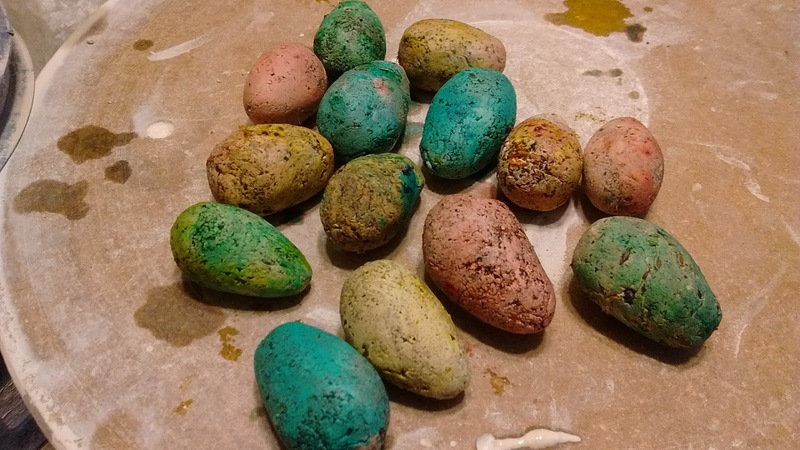 With regard to the pottery tour this year, I am sorely tempted to make it an extravaganza, and invite like 5 other artists to join me and put up tables and tents in my yard - have a little mini art fair. My hesitation is that I then feel guilty if other people don't do well; that, and I am such an extreme introvert that spending the day with 5 other people no matter how much I like them is FAR more exhausting than just hanging out, waiting for visitors. Hmm. I'll cogitate on it a bit longer. In other news, my truck surprised me by inspiring a name within a week of joining me: she is the Gray Lady. She has two namesakes; one is the ghost of Ravenclaw Tower, who all you Harry Potter fans out there sill remember from The Deathly Hallows. The other is the venerable New York Times, which has long worn the same nickname, in the hope that my truck will share some of the newspaper's longevity and reliability. 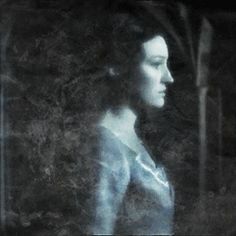 Since it is named in part for a ghost, let us hope Helena Ravenclaw will forgive me for saying: long live the Gray Lady! I've yet to give this truck a name, but I am open to suggestions! I am pleased all to pieces with it, but there were a few bumps in the road getting there. In fact, we bought a different vehicle on Thursday! I didn't take it to my class in Portland, because I still had the rental vehicle, so I thought I might as well get my money's worth for it. GOOD THING!!! Because Friday morning, I took the new car- which we will call the Red Devil - less than a mile to the supermarket. When I drove back in my driveway, I noticed a puddle of oil where the Red Devil had been parked the night before. 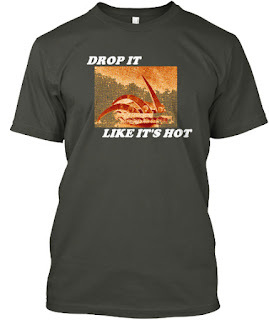 Not a drop, not a splotch; a puddle. Alarm bells! Doug placed a clean white piece of paper under the engine and let it idle for a minute - it was covered in oil. So he put a pan underneath it and let it run for ten minutes - there was more than a quart of (thick, filthy!) oil in it. He came back in the house and suggested I stop payment on the check. The dealer came and got it, after we insisted that NO WAY ARE WE DRIVING THIS VEHICLE. I was kinda pissed off at him anyway - I watched him put a sticker on this truck that turned out to have a major, fire-hazard-sized oil leak, so I was feeling uncharitable. Thank heaven I didn't drive it to Portland. It would have seized up on the highway. 4. Issuance of certificate for substandard vehicle. A person commits a Class E crime if that person knowingly causes an official inspection sticker to be attached to a vehicle that does not conform to the inspection standard. ...and I don't see how he could have failed to be aware. Anyway: if you are in Maine, don't buy a car from McKeon Motors in Gardiner. But now: flip the script! After those disheartening events, I logged onto the List of Craig and made some appointments for today to check out private sales, then rented a car (again!) for today. Shout out to my new friends at Enterprise Rent-a-car in Augusta, who have been so accommodating on short notice, and even found me a small discount when I had to rent a car a third time in a week. 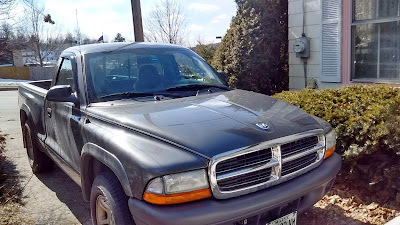 The first vehicle I looked at was this 2004 Dodge Dakota, a 4-cylinder, front-wheel drive truck with only 73000 miles on it. This truck is pristine. Engine is virtually silent, not a drop of oil or bit of smoke out of the exhaust. In the glove box was the owner's manual with the notepage in the back documenting all the maintenance over the years. This person - an older fellow, who passed away a few weeks ago - was religious about changing the oil, rotating the tires, changing the belts. I told Doug during our test drive: "It's like my Dad maintained this car." My dear old Dad, gone more than 15 years now, was a bit obsessive about things like that. That's my excuse for being bad at car maintenance: with my first couple of cars, I never I had to check a fluid level or tire pressure, because whatever it was, my Dad had already done it. Coming upon this car - for a price that I could come up with in cash - is enough to renew my belief in angels. Thanks, Dad; I'll do better with this one, I promise. In other news, I have been accepted into the Portland Fine Crafts show in August, and now I have a truck to transport my stuff! Glad to have a happy car story for once! Last month I gave my car a name: Ghost Pony. After three years, causing me...well not nary a headache, but relatively few, I was just fond of it. So I named it. And then it died. It joined Honored Dead in Sto-vo-kor, and became a part of the silent majority. To be a little more precise, I don't know for sure that the timing belt did any damage when it broke. The only way to find out, say the dudes at VIP Auto, is to put a new timing belt on and see if it still has enough compression to run. (That sounds...I dunno, not quite right? Like, can't you see the damage? But they are the experts, and "Lori doesn't understand it" is not the same thing as "It's not true.") But it costs a bunch of money to put the belt on, with nothing remotely like a guarantee that it will be drivable again. So I find myself as I so often have, carless and needing to get this sorted sooner rather than later. A few months ago I had a hope to buy a (relatively) late model compact truck, but now the Magic 8 Ball says recession coming soon (I shook it three times, y'all, just to be sure! ), so I don't want to be stuck with a car note. I have my eye on a couple of little pick-ups at a local shade-tree dealer. He's just this retired guy who buys old cars, fixes them up to pass inspection, and sells them. He's a bit of an oddball - doesn't really need your business, and doesn't care if you know it. But he seems honest enough. Anyway, he's got two trucks that fall into my price/size/ mileage range, and I am going to check them out today. Meanwhile the Ghost Pony sits in my driveway like Schrodinger's Cat, neither dead nor alive. I could put $500 into it and maybe have a good-as-new car, or I could set $500 on fire; or I could sell it for short money on Craigslist and be done with it. Or I could just not decide. I'm going with option D. Obviously. Soon I hope to introduce my new vehicle, but though it has long been my custom, I am starting to feel a little superstitious about naming it. Some people knock wood; maybe I could stave off bad luck by keeping up with the maintenance. Once again I am amusing myself on Teespring. Give the world a peek through the spyhole! 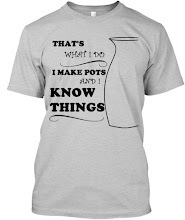 Like a secret language, other potters will recognize those falling cones - dropping like they're hot! - while everyone else is mystified. Because I am a second grader, apparently, this amuses the hell out of me. If you might want one for your very own, check it out here. With apologies to Snoop Dogg.